The Slovenian countryside: Haloze | What's Happening? Haloze is a region in the north-east of Slovenia, bordering Croatia. Haloze is scarcely populated, partly because it’s such a hilly area. Slovenia itself isn’t exactly densely populated, with only 2 million inhabitants and with its three biggest cities having a population of 250.000, 100.000, and 50.000 inhabitants, but it’s hard to build houses in between hills…so you will find even less people around here. The fact that it’s not crowded here leaves space for a lot of beautiful nature. The hills make sure that wherever you look, everything that’s here seems to be waving as you look at the horizon. On the top of a hill there’s breathtaking sceneries, varying from groups of trees growing on the side of the hills, to deserted roads endlessly winding and seemingly going nowhere, to vineyards and colourful houses scattered throughout the landscape. Haloze is famous for its wine production. On every second hill there is vineyard and a lot of people own special ‘wine houses’ which are especially for the production of wine. It’s a good area for vineyards, since vineyards typically grow on hill sides, where the soil is not valuable for other kinds of plants. Locals here have also told me that because the altitude here (300m) is right for vineyards, it is low enough to still be part of the normal land climate, but high enough so that the cold air would sink to the bottom of the earth and the vineyards don’t get cold and can grow for a relatively long period of time. 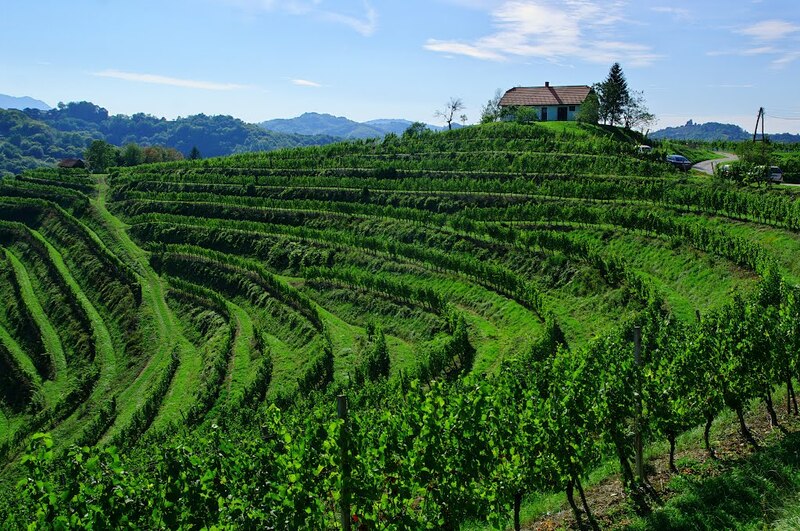 Slovenia is a wine producing and exporting country and produces mostly white wine. The biggest markets for Slovenian export wine are in the Balkan region and in the USA. Although a lot of wine is exported or sold on the market, the Halozians like to enjoy their own wine very much. The family of my girlfriend had a big harvest last year, but they themselves drank most of it…and I was lucky to be given the change to taste this lovely sweet wine myself. Often when I went on a hiking tour with my girlfriends’ family, we would stop at some small house where there turned out to be a wine cellar to taste the latest harvest. Honestly, I get why they rather drink the wine themselves. I dare say the best thing to do around here when you’re visiting Haloze is to get a mountain bike and drive around. In general transport here goes by car, since it’s quite impossible to go up and downhill every day. There is no lighting on the roads, so when the sun sets, it’s completely dark and you see literally nothing. And a hilly area where the road is winding constantly is not a place where you want to be at night; you don’t want to drive off a cliff. But in daylight it is amazing to cycle around. Yes, you got a have a good condition, because you’re gonna be climbing and pushing your bike uphill a lot. But the reward makes it worthwhile. You will see sceneries you only see in movies or encyclopedias and can be cycling in peace and quiet for hours. Here and there, after you’ve made a huge effort again climbing some hill, you can sit down, take out your sandwiches and eat them in silence, enjoying the view of endless hills, vineyards, trees, grass and the sky, in which, on a good day, you can see spectacles of shrouds and weird-shaped clouds, while the sun shines down on the colourfully painted houses, that are situated throughout the area. You would say it’s hard to get lost here when cycling here. Often there’s only one road leading through the hill, so it’s virtually impossible to take a wrong turn. Still I did it. But don’t worry, I guarantee you that it won’t happen to you, I just got a special talent for getting lost, even when it’s technically not possible. And the sun was already getting low, and I knew it was extremely dangerous to be there in the dark. So at some point I was getting really worried. Fortunately the place is not completely deserted and there are still some houses here and there. So I rang the doorbell of the nearest house to ask for directions. A guy my age opened the door and I opened the conversation with ‘Hi, I’m lost’. I told him my story, he told me where to go, but when I wanted to go he asked me to come in and have a beer with him and his friend. So of course I accepted and I went inside. They told me were the only people in the area that spoke English, so I was lucky to have rang precisely their doorbell. Although the people from there would still invite you in even though they didn’t speak English. By accident they knew my girlfriend and they knew where she lived, so I was saved and I could sit back and relax. We drank beer, ate Christmas cookies, and talked about life and travelling. It was already getting dark, too dark to move around bike, so we loaded my bike in the trunk of their car and they drove me back home. They hardly saw any strangers around, let alone foreigners, so it was a pleasure and a little adventure for them as well. They invited me to stop by any time I liked, and on my next trip I will probably see them. In Haloze I’ve seen some fascinating landscapes. And that says something, since I’ve travelled quite a lot. Plus the people from Haloze are known to be among the friendliest people in Slovenia. If you’re in for a place where you’ve probably never been, outdoor activities, gawking at nature, sweet white wine and friendly people, then this is your next destination. By chance you’ll have some locals inviting you to stay at their place and if you go in November-Octobre, you might catch some fun grape-harvesting! http://www.diegomallien.com/travelling-and-culture/slovenian-countryside-haloze/http://www.diegomallien.com/wp-content/uploads/2016/06/haloze-2.pnghttp://www.diegomallien.com/wp-content/uploads/2016/06/haloze-2-150x150.png 2017-03-31T11:03:27+00:00 Diederik MallienTravelling and CultureHaloze is one of the most rural places in Slovenia Haloze is a region in the north-east of Slovenia, bordering Croatia. Haloze is scarcely populated, partly because it’s such a hilly area. Slovenia itself isn’t exactly densely populated, with only 2 million inhabitants and with its three biggest cities having...Diederik Mallien malliendk@gmail.comAdministratorWhat's Happening?